JOHN MAY. On 1 June 1678 John May, mariner of Deal, aged 28, married Mary Pettit, aged 25, at the church of St Mary the Virgin, Dover. We would expect a baptism date around 1649/50 for John. The nearest is John, son of the fisherman John May and Elizabeth Dove, baptised at Ringwould St Nicholas on 7 Feb 1651. Ringwould is only a mile from Deal, and John named his first two children John and Elizabeth. The date is 8 months later than expected, but this may be within the range of John May’s mental arithmetic. John and Elizabeth were common names, and not all the records have survived from this period, but this one looks promising. John’s grandson was named Henry. There are no Henry Mays in Deal before this, but several of that name in Ringwould, including John’s grandfather. Ringwould was also Mary’s birth parish.We have not found a more likely marriage for John May, son of John and Elizabeth. John was the youngest of four children. An earlier John died in infancy. Ringwould is a little way inland, but the village of Kingsdown on the coast lies within Ringwould parish. It is likely to be here that the fisherman John May and his family lived. John’s mother died when he was ten years old. John became a mariner, though not necessarily a fisherman like his father. Before his marriage, he had moved to Deal, just north of Kingsdown. “However the sand got into Sandwich, it did Deal a big favour. 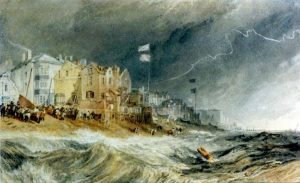 As the Cinque Port’s harbour silted up from about 1500, the merchant ships out in the downs, protected by those hidden shallows from the Channel’s full fury, began to offload their cargo into small boats called hoys that came out from Deal. A new town was the result. John May would have been one of those boatmen who plied their trade between Deal and the shipping moored in the Downs, or carried cargo around the coast. MARY PETTIT. With Mary’s family, we move away from the long line of Deal boatmen stretching down to the 20th century. Mary was the daughter of Francis Pettit and Thomasin Bowles. Her father came from a long line of yeoman farmers owning land and property in the village of Ringwould. He was a freeman of Dover and a constable there. We know from her marriage licence that Mary was 25 when she married in 1678. This gives her a birth date if 1652-3. Mary was the second child in a family of three girls and one boy. 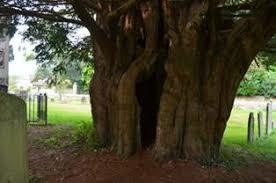 As children, Mary and John would doubtless have delighted in the huge hollow yew tree in the churchyard of St Nicholas, Ringwould. The tree was already ancient at that time. Both children were born during the Commonwealth period, between the execution of Charles I in 1649 and the Restoration of the monarchy with Charles II in 1660. Mary’s father died in July 1667, when she was about fourteen. He left Mary and her sisters £20 each. Mary’s bequest was to be paid within 11 years of his death. On 9 Feb 1668/9 her mother Thomasine married again, to Ingram Sutton, a clergyman of Buckland by Dover. Mary moved there with her mother and siblings. Her stepfather had at least two teenage daughters, and there may have been other children as well. Four years later Ingram Sutton also died, but Mary continued to live in Buckland with her mother. She was living there at the time of her marriage to John in 1679. Their marriage licence says that the couple were to marry on 1 June 1678, either at Buckland Next Dover or at Dover St Mary. The wedding has not been found in the Buckland register, so we assume it took place at St Mary the Virgin, Dover. I have been unable to find the relevant page of the register to confirm this. Two years after Mary’s marriage her younger sister Thomasin also married a John May, but he was a saddler from Dover. At the time of their marriage John May, mariner, was living in Deal. Mary joined him there. The couple had four children baptised in Deal. None of their children appear to have died in infancy. The most likely burial for John is on 23 Jan 1711/12. He would have been around 62. This was towards the end of the reign of the last Stuart monarch, Queen Anne. Mary’s burial has not been found in Deal. There are burials in Ringwould for Mary May on 21 April 1715 and on 17 April 1720. She may have returned to her childhood home for her last years. If so, then she too would have been in her sixties. She lived to see the Jacobite rebellion against the Hanoverian king George I. Off Deal’, Joseph Mallord William Turner | Tate, www.tate.org.uk, engraved by W. Radclyffe. www.tate.org.uk, engraved by W. Radclyffe. Canterbury diocese archives, Registrations of general licences, Sequestrations. DCb/L/R.